The new stylish Stylist models from LG offer a heat pump and air conditioner that is completely different to anything else on the market. This Stylist indoor unit is only 121mm in depth and offers soft airflow from 3 sides, be it in heating or cooling mode. The stylish controller offers full control of the system including setting different LED mood lighting settings from the LED lights built into the indoor unit. 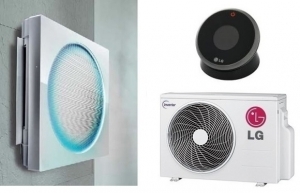 If you want a stylish and contemporary heat pump and air conditioner take a look at the LG Stylist models.